It's inspired by Dark Crystal, and seemingly tons of other stuff. In Smoke and Sacrifice, you're a mother searching for her child in a bizarre underworld. All sorts of creatures inhabit this landscape, including jellyfish-like creatures called polyps and a cute hybrid of hogs and porcupines. It immediately reminds me of Don't Starve to play—you craft things to survive, which is extremely familiar. While you start by creating boots, melee weapons and small bombs, though, eventually you'll be creating steampunk-infused mechs. There's a lot going on here. What sets Smoke and Sacrifice apart from other survival games is a stronger sense of narrative drive. You play as Sachi, a woman who sacrifices her child to an entity called the Sun Tree in order to keep her land from being consumed by darkness. Sachi eventually finds herself in an underworld trying to unravel exactly what's going on, and what happened to her child. You then take on quests and journey across what a huge, varied landscape. It's not going to be easy: you have to save manually at infrequent posts, and one bad encounter—or just wandering onto a surface you're not equipped to endure—will easily kill Sachi. You need a light source to survive at night, like a lantern which you can craft, otherwise the surrounding smoke will consume your character. In my hour-or-so with the game, I didn't get close to unlocking mechs, but I'm intrigued to experience the long journey there. The developers promise a big game, and there's a lot of systemic potential here. I see creatures battling each other as I explore the landscape, and wandering into the aftermath of a fight can make it easier to gather resources, since everyone's dead and I behaved like a coward. 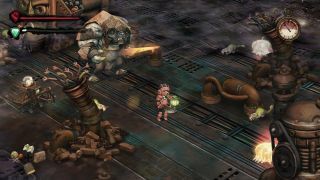 While the creatures in this part of the game all want to kill Sachi, eventually you can tame some to help you, including the game's larger enemies. The developers at Solar Sail cite The Dark Crystal as a thematic influence, but also describe the game as a 'bucket of things' they like: hence a world where porcupine/hog hybrids and steampunk mechs co-exist. The only thing I struggled with a little in this demo is collision detection when performing actions like trying to catch a creature in a bug net—getting a sense of that was tricky. The art, though, is gorgeously offbeat, and the idea of reframing a survival game as a narrative-driven RPG is really cool to me. Smoke and Sacrifice has no release date yet, but expect it later this year.